Does the CfDS want everyone to turn their outdoor lights off? We all need lighting. The CfDS works towards exterior lighting, public and private, being directed where it belongs and not into the sky and into neighbours’ premises. "New streetlights do not contribute to light pollution". Unfortunately, new streetlights, including bright blue-rich LEDs, can sometimes cause more light pollution than the older lights they replace. Light pollution is not solely caused by old orange low-pressure sodium lights. Mathematical modelling shows that the main cause of light pollution is from light emitted at or just above the horizontal (mostly in the first ten degrees). There are many flat-glass lights in the UK that do shine only downwards, but many still shine though those critical ten degrees above the horizontal and cause skyglow. "Full cut-off (non-polluting) street-lights illuminate a smaller section of the road, so you need more of them". This is a very common misconception, even among local councils. It is not true that you need more street-lights if you use full cut-off units. 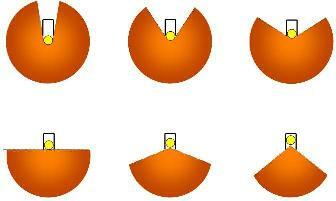 The images below, show the hood of the lighting unit at different positions over the bulb, and the angles of illumination. The three lower lighting units are all full cut-off (flat-glass). A light like the one at lower right would illuminate a smaller section of road, but not so the lower-middle lamp. Indeed, in the lower-left case, the bottom of the bulb is just above the bottom of the hood, so no light can escape upward although the light can shine horizontally outwards to infinity. Such a light however, could also shine into neighbouring homes, disturbing people's sleep. So the CfDS recommends the ideal street-light to be the lower-middle type; no upward light, but retaining a good spread. Even if full cut-off lighting does illuminate a smaller section of road, taller columns can be used. In many places, full cut-off lighting units are put on the old columns and achieve their effect. On the M5 motorway in SW England, every five old-style lighting units have been replaced by FOUR full cut-off lights (i.e. further apart). The road is well lit. Full cut-off (flat glass) streetlights don't need to be closer together. The optics and the column height determine the spread of the light. "More lights will decrease crime". Those who sell and choose road lights make claims that they will deter criminals. There is no direct link between higher levels of lighting and lower crime levels. Indeed, crime rates have decreased in many UK areas where street-lighting has been turned off in the small hours of the morning. In Essex, night-time crime almost halved in Saffron Walden and reduced by over a third in Dunmow after the lights were turned off - presumably because it made criminal activity more difficult. Don’t take our word for it – search ‘streetlight switch-offs crime increase’ and ‘streetlight switch-offs crime decrease’ and see what you find. Are the thousands of unlit villages in the UK crime hotspots? The problematic relationship between lighting and crime increases when one considers that offenders need lighting to detect potential targets and low-risk situations. Consider lighting at outside ATM machines, for example. An ATM user might feel safer when the ATM and its immediate surrounding area are well lit. However, this same lighting makes the patron more visible to passing offenders. Whom the lighting serves is unclear. Other studies on light and crime include those in Clark's "Outdoor Lighting Principles for Australia" (crime was cut drastically during a period of power cuts); the success of IDA's "Dark Campus" program (Dark Campus Programs Reduce Vandalism and Save Money); the Ramsey and Newton studies for Home Office/CPU (no link between lighting and crime); the West Sussex experience in the period in the '80s when many street lights were turned off late at night. More details can be found on our Lighting & Crime page. "Light pollution is inevitable in towns and cities". No - your taxes should not be wasted on producing light that never hits the ground. The visibility of the night sky and comfortable ambient night-time lighting are not incompatible. Many urban councils have fitted new, ‘sky-friendly’ lights and at the same time improved their residents’ night-time environment. "Only astronomers need dark skies". There are dark-sky campaigns in most developed countries in the world. Large numbers of their members are not astronomers, but concerned citizens who think that wasting energy and money, and spoiling the environment, are wrong. Everyone is entitled to see the stars: after all, they, together with the Big Bang that kick-started the Universe, created all the atoms that make up our bodies. People who encounter the night sky for the first time on holiday in less urban places are without exception impressed, and although they are not astronomers would like to repeat the experience back home. "Surely the problem of light pollution is just too big for us to make a difference". This is often heard, but defeatist arguments will lead to nowhere but a worsening of a bad situation. Of course light pollution is not a problem that can be solved overnight - but we can and are making a difference. Politicians worldwide are beginning to consider the problem of light pollution. DEFRA, the UK government’s environment department, has recently shown great interest in the issue and has published information for retailers and buyers of exterior lighting. A Royal Commission and a Parliamentary Select Committee have examined the problem and made recommendations to the government. Convincing just one Member of Parliament or local councillor may lead to change - just look at the example of Calgary, Canada, where the local administration has retro-fitted all street-lights city-wide and saved a lot of money. The important thing is the momentum that the CfDS and fellow organisations have created - most people have now heard of light pollution, and are doing something about it. Spread the word about light waste and its negative effects: a problem with a simple solution that brings many benefits. In the words of Dr David Crawford, co-founder of the International Dark-Sky Association in the USA: With good lighting, everybody wins . Recent history shows that big problems can be tackled with decisive action. 50 years ago, London and many other big UK cities had a serious ‘smog’ problem caused by the burning of poor-quality fuels in homes, factories and power stations. People died. That all changed in the 1960s, when the Clean Air Act allowed only smokeless fuels to be used. Another example is the ozone hole - CFCs have been rapidly and successfully banned world-wide. The level of pollution from cars is being reduced dramatically following recent legislation.